A surprising deck-builder that's good, simple fun. Four wizards walk into a dungeon and kill everything. Sometimes you just need a simple premise. Pixel Glory isn’t much more than this. You and your friends are wizards competing for glory in a dungeon that (literally) poses no threat to them. It’s not about the danger, but about the number of monsters you can slay. A competitive deck-builder for four players, Pixel Glory’s action is divided into two equally engaging phases. It’s starts with an auction, where players are bidding on the spells that will create their decks for what’s to come. After nine fast-paced auction rounds, players head to the dungeon. There, they draw spells from their deck, attack the monsters of the dungeon, and collect Glory for any big uglies they kill. They fight their way to the Dungeon Lord and once he’s dead, everyone counts up their Glory points to determine who is the greatest wizard. Combat is easy to learn. Spells come in one of three elements: Earth, fire, or water. Most enemies are based on one of these elements. That means each element also has a weakness. Water beats fire, fire beats earth, and earth beats water. When you play a spell card an enemy is weak to, it does an extra point of damage. Some cards do straight damage, while others have text. But it’s all easy to follow. Pixel Glory is simple, engaging, and fun. A total surprise considering the packaging. From the box, this looks like it’s going to be a rip-off of Boss Monster, a card game where you build a dungeon to test adventurers. But these two games only share their pixel art style. Otherwise, Pixel Glory stands firmly on its own as a good filler game. 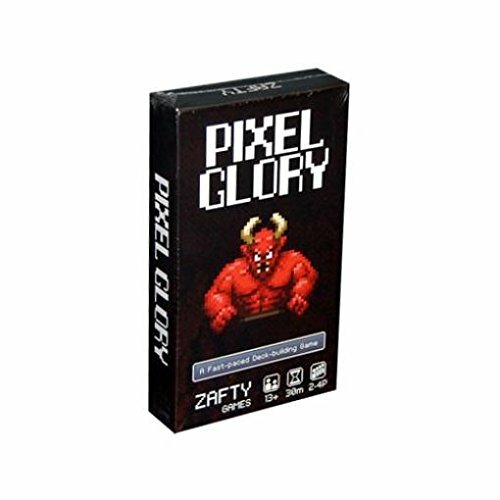 We received Pixel Glory as a promotional copy, which made me assume it would be terrible. Why would anyone send us a free copy of anything? I was very suspect about this game. Each round, reveal one spell card per player. Reveal a monster from the dungeon as well. Players secretly play one of their nine bid cards. Players pick a spell, from highest to lowest bidder. Shuffle your deck and the monster deck, putting the Dungeon Lord at the bottom. Reveal the top three monsters. Players draw three cards and must play all three (though once can be kept in reserve). If a monster is killed, that player claims the card. If a monster is not killed, the players gains one combo cube. Trade in three combos to either instantly kill an elemental monster or draw four cards. Keep refreshing the dungeon so there are always three monsters. The game ends as soon as the Dungeon Lord. Winner is the player with the most Glory points (from monster cards). Your average deck-builder with a great drafting twist. You trade in combo points to draw four cards and then play cards that let you draw more cards. It ends with a flurry of damage. I couldn’t deal enough damage to kill an enemy and the next player swooped in to finish them off. Here’s the big downside of Pixel Glory. This is meant to look and feel like an old Japanese role-playing game, which seems a bit like an excuse to save on quality art. Most card art is forgettable and even interchangeable and the card design is uninspired. I would have loved to see pixel art done in a more interesting way. A very light game, Pixel Glory can be taught in just a couple of minutes. Yes. In fact, these Wizards were probably drunk the whole time. This would be like role-playing the part! Plays a little differently than your standard deck-builder. The combo system helps those who draw crappy cards. Bad art and card design. Games tend to end in lopsided victories. None, because according to Pixel Glory, Wizards never take any damage. You want a casual deck-builder. You need a new filler game that takes about 30 minutes. You dream of the old days of 16-bit dungeon-crawling RPGs. Questions about Pixel? Ask in the comments. Played Pixel and have your own opinion? Tell us! We may feature you in the Dog and Thimble Podcast.